Thank you for choosing Diamond Pier foundations for your project. We'll help you get started. This guide is meant for projects using Diamond Pier foundations sold through retail stores, models DP-50/50" & DP-75/63". For larger projects please visit our Engineered Projects page. You're a savvy homeowner, ready to take on your own projects. With Diamond Pier foundations you can finish your project in one weekend instead of two! Every city can be different when it comes to building codes. You may need a building permit in order to get started on your project. Contact your local city hall and ask for your building department. They can lead you through applying for a building permit, and what you'll need to submit to the building code department. You may need assistance in designing your project. A local lumber store or building store pro-desk is an excellent place to find answers when deciding the layout of your project, and placement of the Diamond Pier. While we aren't able to design your project, we are here and ready to help all our customers better understand how Diamond Pier foundations work, and to answer any questions we can about your specific project. Properly Drained, Maximum slope 2:1. Works in Silts, Clays, Sands & Gravels. Diamond Pier foundations sold through retail outlets are designed for projects that are founded in normal sound soils. Normal soils are typical in most residential neighborhoods throughout the United States and are defined in the International Residential Code (IRC) Table R401.4.1. Presumptive Load-Bearing Values of Foundation Materials. For residential applications, the two most common prescriptive bearing soil types relied upon in the IRC table, and in most local codes, are 2000 psf sands/gravels and 1500 psf silts/clays. Diamond Pier foundations sold through retail outlets must be founded in soils with a minimum 1500 psf bearing strength. Supporting soils that do not meet the presumptive bearing strength defined in the applicable code for your area will not provide expected foundation capacity, and their bearing capacity may need to be determined by a soils investigation. Ask your local code official for soil information regarding your site. Additional soils information may also be available at the U.S. Geological Soils Survey website managed by the U.S. Department of Agriculture—see http://websoilsurvey.sc.egov.usda.gov/. Some soils may not be appropriate for supporting Diamond Pier foundations. Some examples include soils that are weaker than 1500 psf, soils that are highly expansive, shifting or sliding soils, soils on slopes greater than 2:1 (27 degrees), contaminated soils, or soils where traditional concrete piers, accepted by local codes, are unable to provide adequate bearing to support the loads of the project or to protect the structure from the negative effects of frost heave. Where unsound soils exist, a registered design professional may be required to review the project. Soils can also be weakened when they retain standing water or are improperly drained, and in certain types of soil this can also cause heave problems. A site depression with standing water or the potential for water to pond, pool, or saturate the soil may be an indication that the soil is not sound. Downspouts that discharge at or near a foundation may also cause soil problems, and setting a Diamond Pier foundation adjacent to any water body should be considered carefully. Depending on the variables involved, soils at the edge of or within lakes, ponds, rivers, streams, or tidal zones may be considerably weaker (as much as 40% or more) than dry or well-drained soils. Soils adjacent to existing foundations may also have been improperly or loosely backfilled, which may also cause poor drainage or poor soil conditions. Be sure to inform your project designer if any of these conditions exist. 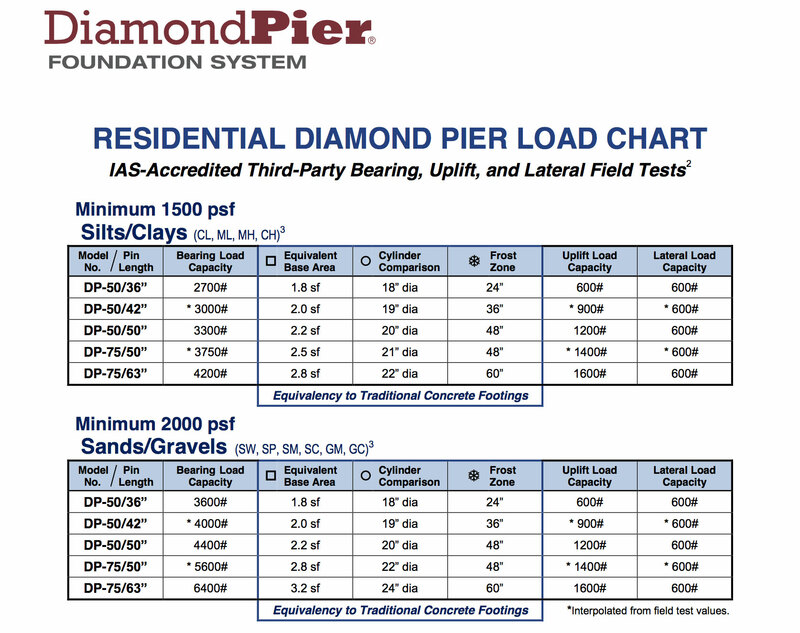 Please contact PFI if you have any questions regarding your project or soil conditions, and/or the proper use of the Diamond Pier product or "Residential Diamond Pier Load Chart," provided in Table 1 of the full Installation Manual. Our load chart will help you determine if you need the DP 50/50 or DP-75/63. 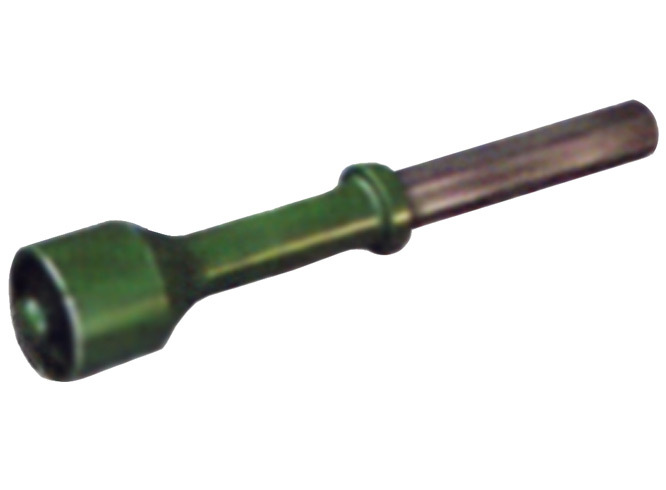 All capacities use four pins of the specified length per foundation. 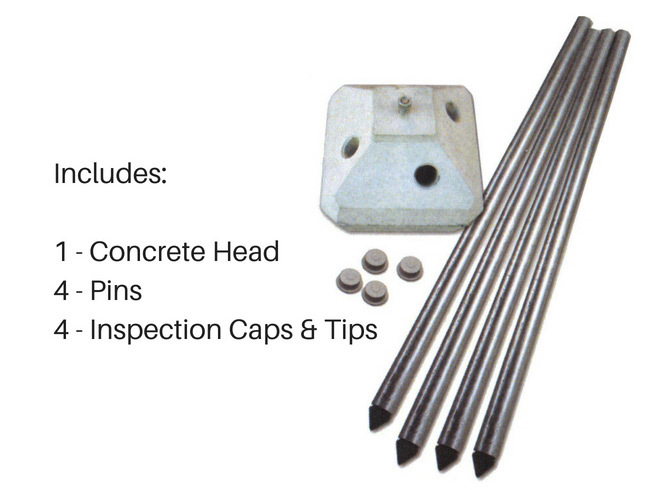 Pin length includes that portion of the pin embedded within the concrete head. See “Check Your Layout” on page 9 in the Installation Manual for more information on pin/pier layout and spacing restrictions. Size Diamond Pier and provide supporting code compliant documents. Each municipality is different, though. So be sure to contact yours. Determine safety zones and adequate clearances. Read more below. All underground utility lines must be located and properly marked by your local official utility locating service, and all privately run lines must also be identified and located by the proper authority. If there are any electrical lines in the area, de-energize the power source prior to installing the Diamond Pier foundations. Never allow bodily contact with uninsulated portions of the automatic breaker hammer. Wear properly rated rubber-insulated gloves and boots. In addition, if underground utilities are located on the site, check with your local utility locating service to confirm required safety zones. You must ensure that the horizontal pin distance for your foundation will have adequate horizontal clearance to be well outside all safety zones, including the 6” Diamond Pier (DP) safety zone. See Figure 2 and Table 2 in our Full Installation Manual. There is no other foundation system for a deck that is easier to install than the Diamond Pier system. You can set 6-8 footings within the first hour and start building immediately. The Diamond Pier foundation is guaranteed to last the lifetime of your structure. Put your mind at ease with a product that has a lifetime warranty. Diamond Pier footings can be integrated and installed into your existing landscaping without damaging plants, and using only handheld tools. And no messy mixing of concrete! Avoid heavy machinery in your yard. 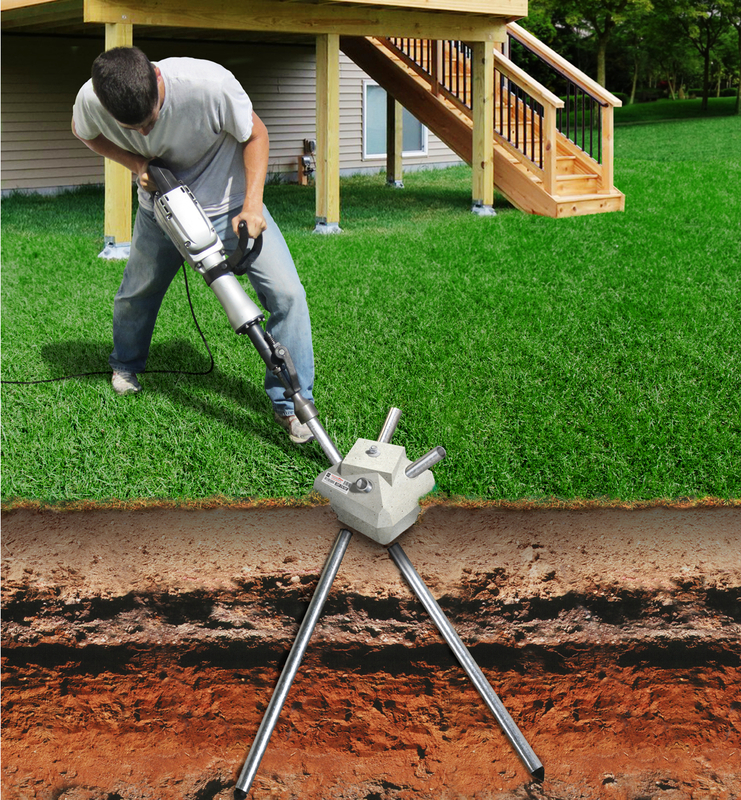 The Diamond Pier foundations are installed with handheld tools for a simple, clean installation. Head over to our Installation Page for steps, videos and more. The Diamond Pier foundation is easy to use, remove, and troubleshoot. 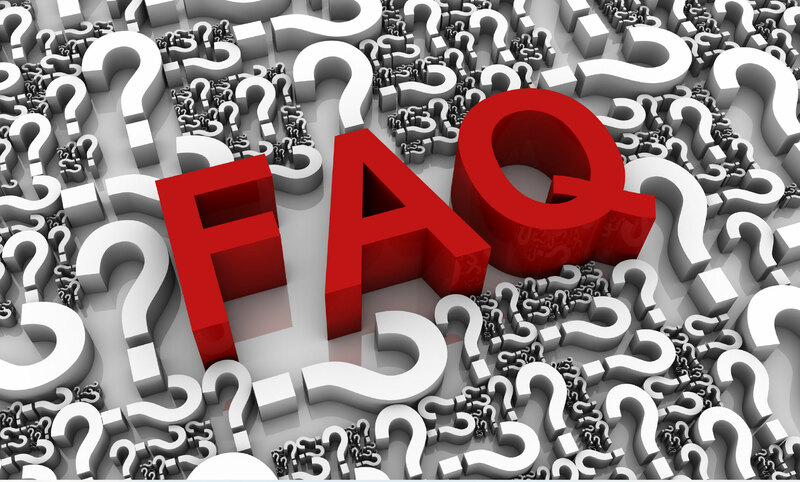 See our full list of FAQs. 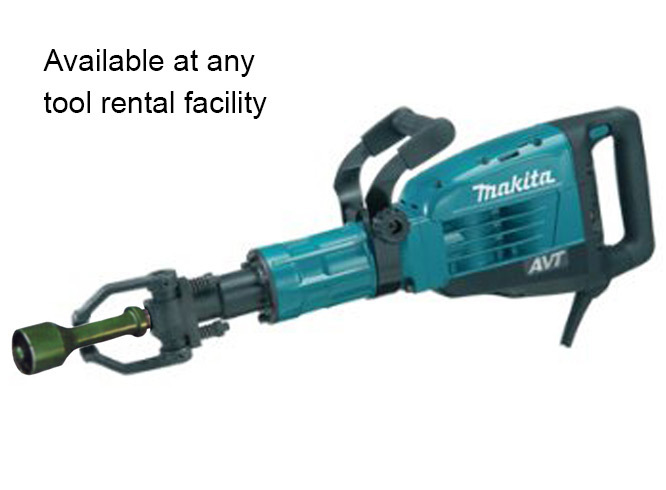 Please see full removal instructions in our full Installation Manual, page 13.